The first two 13-day trecenas of the new Tzolk’in round Awaken the Consciousness of an evolved Spirit of Higher Consciousness. First, Crocodile/IMIX Awakened the Consciousness of Consciousness. Then, Jaguar/IX Awakened the Human mind to the Consciousness of itself as a Being of Spirit through the Wisdom of an Experience. We Ascended on 13 CIMI, a Sign of Major Life Change. Our Change, a transition from one thing to another, is a result of Movement. The outcome depends on which way we go. The next most important step in the germination of our Seed, is a Choice of Direction. Deer/MANIK is guiding us to Discern a Direction by our Meaning and Purpose for Being. Tone 2 represents Duality, the Human process of Discernment that compares one thing to another. We discern all our choices by the pros and the cons. We were designed to see the two sides of our self inside and out. We even identify with two minds, the left and right sides of the brain. In the seat of Human Consciousness, half of our brain supports reasoning and the other half was designed for imagination. All parts of our Self reflect the balance between our Human and Spirit Identities. This Subconscious Consciousness of Duality helps us to accept the Truth of our two Identities. Our Human state of mind is “Knowing without Knowing we Know.” Our Spirit Knew from the beginning that it was our First Identity. Turning to Spirit, Human can Know what we already knew as Truth in the realm of Spiritual Consciousness. The Deer/MANIK trecena will guide us to Define Our Self by our Meaning and Purpose. The True Discernment of our Identity and Character is the comparison between what we were Intended to Become, and how closely we are carrying out our True Meaning and Purpose. This is a Divine comparison that Human can make that maintains the Integrity of Harmony with the Whole. Star/LAMAT is the Day Sign that identifies Human as a Personification of Light. Our Spark of Divine Light was given the Power to generate its own Light. Different than the Moon, a reflection of Light, we were created to Shine on our own. As the firstborn of a Supreme Creator, symbolized as the Sun, we were created in the same image. From this Identity, we can Discern a Divine Direction. The orbit of Venus reflects the two places that it resides for 260 days. It exists at the Dawning in proximity to the Sun. Like our Awakening of Consciousness, in the realm of Spirit we only saw the One Light of All. In the Human realm, we reside as the Evening Star in the darkness where we can identify our own Light. 2 Star/LAMAT can Multiply to Abundance the Discernment of our own Light. Star/LAMAT is related to the totem Rabbit, which matches the Cherokee Day Sign for LAMAT. The Rabbit is teaming with Life, a symbol of reproduction, self-regeneration, and Love that Overflows. LAMAT is defined as a day of “pure luck” for its ability to Multiply to Abundance. 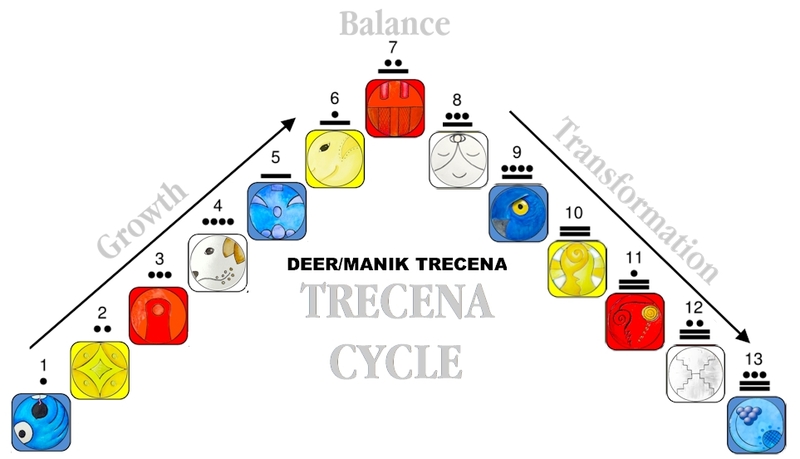 As we are engaged in a Discernment of Self, the Deer/MANIK trecena offers an Archetype for comparison that is capable to Multiply its Light to Abundance. Days led by LAMAT offer the aspect of “Instant Manifestation.” Whatever we focus on will be Multiplied to Abundance. LAMAT defines its purpose to shine its Light Equally in all directions. This is how we will shine an Eternal Light. When a star turns its energy inward, it implodes. We are Inspired to an Intention to shine the Light of Love Overflows in all directions. As a trecena of “Light” we are in a new binary cycle of comprehension. Every Truth is discerned first through an Inspiration of Spirit. Wisdom is completed in the following cycle of “Darkness” – the application of Truth that completes Wisdom through a Human experience. This is an important day of Intention, important enough to be guided by Star/LAMAT, the Day Sign that can multiply our Intention to Abundance. As a Day Sign of the South, LAMAT influences our way of being in Relationship with the natural world and one another. The greatest philosophers of all time defined the most important application of Consciousness is to “Know Thyself.” The words are said to be inscribed within the Temple of Apollo, the location of the Oracle at Delphi. Socrates said that people make themselves appear ridiculous trying to Know obscure things, before they even Know Themselves. The teachings of Plato reflect that understanding “thyself” yielded the greater potential for Human understanding. In his “Allegory of the Cave” Plato compares Human’s unconsciousness of self as a state of seeing ourselves as only shadows on a wall. Only when we turn to the Light of Illumination do we realize the Truth. What does it mean to “Know Thyself?” All the Ancient teachings of Spirit define Knowing as a state of Divine Consciousness. Knowing is the purpose for all our Spiritual Gifts. Though “Knowing” is a verb (an action word), Human unconsciously discerns it as a solid state without Movement. In Spirit, “Knowing” is an empowering influence on the dynamics of Creation. Our Spirit is capable to create what the Human mind is able to Imagine and Believe. We can compare Believing and Knowing to discern which is the Highest State of Consciousness. We don’t question decisions based on something we Know. When we “Know,” neither Faith or Belief is part of the equation. Knowing is the Highest Consciousness Human can employ to manifest a Creation. Biblical references to “knowing” are associated with conception (ie. And Cain knew his wife; and she conceived, and bore Enoch; Genesis 4:18). “Knowing” was used as an action verb of Creation. By Knowing our Divine Self, we can Conceive our Highest Creation of Love. As we apply the Inspiration of Deer/LAMAT to become an Agent of Divinity, LAMAT draws our Awareness to our Identity of Light. With the Intention to Know Thyself, Deer can guide us in a direction that maintains the Integrity of Who We Really Are. To all my relations, may we grasp the thread of Ether that connects us to “Knowing” to discern the Wisdom of Divine Consciousness. May we Remember we are the first descendants of a Divine Creator, made in the same image. May Knowing our Self generate the Passion for the Intention to “Thine own Self Be True.” May we see “Knowing” as our the Highest State of Consciousness, evident by the purpose of all our Spiritual Gifts. May we Know our own Light so it can be Multiplied to Abundance to Shine as the Brightest Star in the Darkness that Human can see. I’m grateful that the Truth of Knowing eternally exists within the Human subconscious… that somewhere within we remember the Power of our Spirit, so that when our Human mind hears the Truth, it will be self-evident to our Human Consciousness. I like this card; it has balance.